13:40– A Round of Tweets. 19:40– Sijara Eubanks discusses her UFC 230 fight contrary Roxanne Modafferi as well as being removed from a title fight against Valentina Shevchenko. 38:10– Randy Couture talks about PFL’s inaugural period, the current on getting the Ali Act encompassed MMA, Chuck Liddell vs. Tito Ortiz 3 and even more. 55:57– In the Monday Morning Analyst, Luke Thomas looks at one large reason Tony Ferguson is the toughest obstacle for Khabib Nurmagomedov. 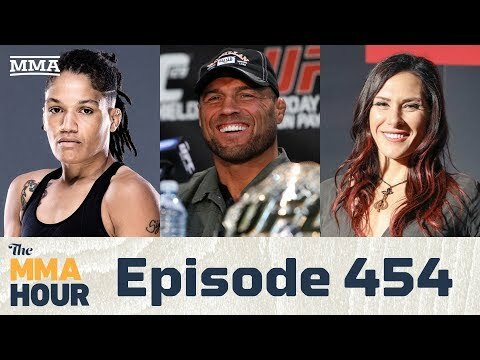 1:14:35– Cat Zingano discuss her future lightweight round opposite Megan Anderson at UFC 232, the opportunity of being a replacement challenger for Cris Cyborg vs. Amanda Nunes, and also much more. 1:34:21– Sound Off featuring your phone calls as well as more on the most up to date in MMA.